Thank you for joining me as we count down to the MFT release. We are four days away from the big day! All the new Stamps, Die-namics, and Stencils will be available on Tuesday, March 7 at 9:00 pm EST. Be sure to check out the MFT Blog to see all the new items being revealed today. Don't forget to leave a comment on the MFT Blog countdown posts, YOU could win one of the five $75.00 gift vouchers. Check out these ninjas, aren't they fabulous? 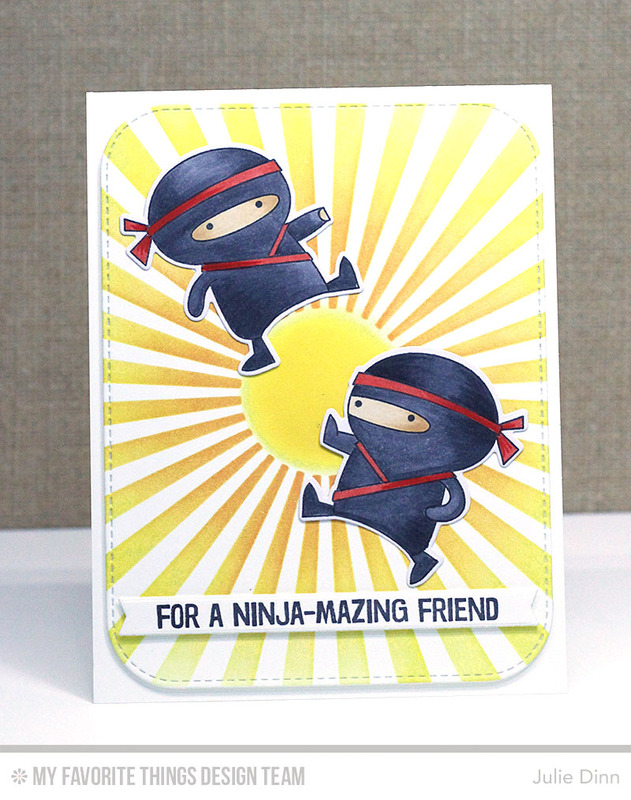 These guys are part of the amazing new Ninja-mazing stamp set. To create the background I used the new Radiating Rays Stencil with Lemon Drop and Orange Fizz Hybrid Ink. Love these fun guys Julie and how you used the stencil for your background. Love your card--esp. the sunburst die. Thanks. OK- ninjas can be adorable! What a beautiful card with the rising sun highlighting the ninja pair! Thanks for the chance to win goodies!! Cute little ninjas, Julie! I like the stencil use, too. Thanks for sharing. Love the cute ninjas. And the background is gorgeous! How cute is this card... love it!